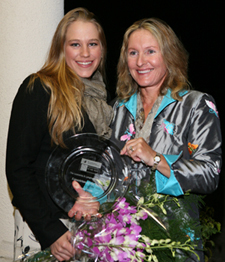 FEI Dressage Rider and Trainer Nancy Later together with assistant Ariel Matisse have won the Leukemia and Lymphoma Society's Equestrian of the Year award for raising over $8000 to support the organization's mission: cure leukemia, lymphoma, Hodgkin's disease, and myeloma and to improve the quality of life of patients and their families. Runner-up in the fundraising competition was dressage rider Sandy Gillespie of Palm Bay, Florida who raised money in honor of her daughter Sara, a leukemia Survivor. The equestrian community supported a cocktail party, silent auction, and light dinner at Grant Farms on February 11th. Over $56,000 was netted from the event which will go directly to the Leukemia and Lymphoma Society. Equestrian of the Year sponsors include Bacardi, Grey Goose Vodka, Palms West Hospital, Equus & Co., Dark Horse Chocolate/ Nan Sexton, Advanced Radiation Centers of New York, Brad Cutshall/Landmark Farms and Polyglycan Anthrodynamic Technologies/ Dr. Foster Northrop. Patrons of the event enjoyed catering by Ken Rose, and over 70 silent auction items organized by Susan Rubin of Beyond the Barn. White tables with beautiful flower arrangements by Karin Flint adorned the cold candlelit night, complete with a stable of beautiful horses. Music by guitar player Todd Miller and a wonderful diverse group of equestrians completed the night. Anna Tillman and Timmy Dutta presented a "wished for" pink bike for this years honored hero, Natalie Davila. Natalie, who is 11 years old, is currently in maintenance phase of Acute Lymphocytic Leukemia. Nancy Later has been a long time supporter of the Leukemia and Lymphoma Society and together with her long time assistant they are a shinning example of how busy equestrians can make a difference in the lives of others. Through help from the Spengler Family who offered their Oak Hill Farm in Pepperell, MA, Nancy and Ariel were able to have a fundraising party and silent auction. They also collected donations through a letter writing campaign and friends and family. Event Chairwoman, Mary Ann Grant, and Honorary Chairwoman, Dr. Melissa Singer who is a pediatric hematologist oncologist wish to thank the entire equestrian community for their support of this event now in its 8th year. For further information about the LLS or how to support next year's campaign, please contact Melissa Mulvihill, Campaign Coordinator for the Palm Beach Area Chapter, at (888) 478 - 8550, or Mary Ann Grant, Event Chairwoman at (561) 301 - 5817.